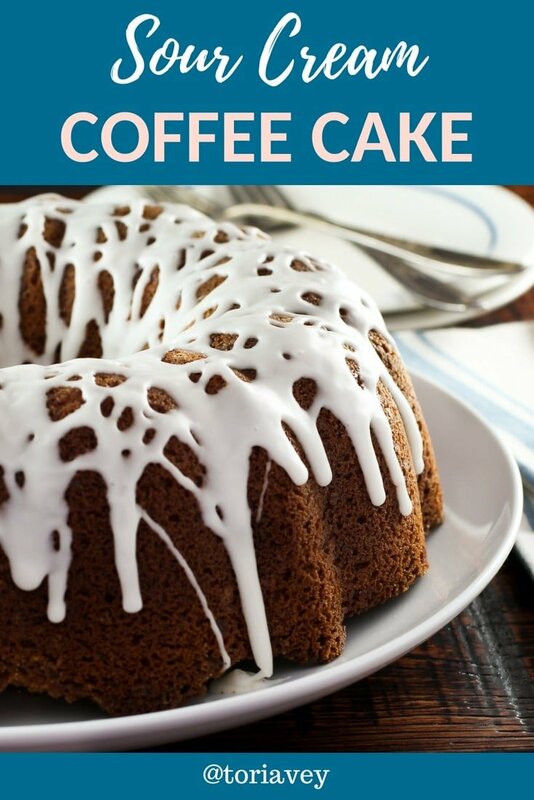 Learn the history of sour cream coffee cake, and try a traditional recipe for this beloved baked treat from food historian Gil Marks. 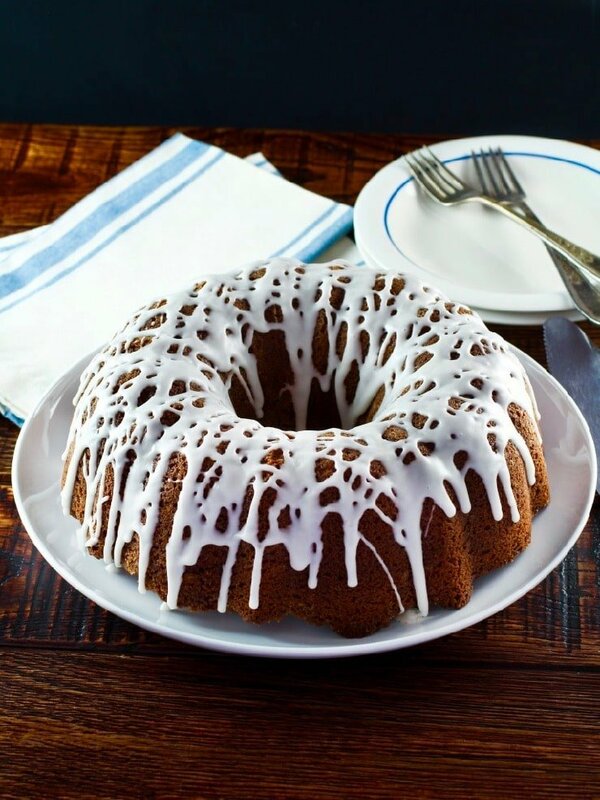 Perfectly moist streusel-filled bundt cake drizzled with icing. Serve with coffee or tea for a sweet afternoon indulgence! 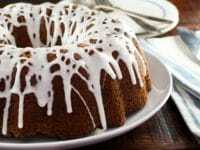 Coffeecakes are baked goods, generally sturdy and informal, that commonly accompany hot beverages. They, of course, can be enjoyed without the benefit of coffee or tea. Yet eating a piece of simple cake with a hot beverage provides textual and flavor contrasts that enhance each item, making for a more substantial and pleasurable experience. Thus cakes and pastries were a fundamental part of the menu of coffeehouses from their onset. The words coffee and tea were first mentioned in English in 1598 in a translation of the travels of Dutch navigator Jan Huyghen Van Linschoten. Actual coffee was only introduced to Europe (outside of the Ottoman Empire) by way of Venice in 1615 and reached England in 1630 (23 years after the founding of Jamestown), several decades before the arrival there of tea in 1652. The first coffeehouse outside the Ottoman Empire opened in Livorno, Italy in 1632; the first in England was in Oxford in 1650. Subsequently, coffee cultivation spread outside its native Ethiopia, while the cost of sugar in Europe plummeted due to the influx of Caribbean cane. As a result by the end of the 18th century, the masses of Europe partook of coffee on a daily basis and it replaced beer there as the most widely consumed beverage. Meanwhile, the Dutch brought tea to North America in 1650 and coffee in 1670. Initially, tea proved more popular. The first coffeehouse in America, the London Coffee House, opened in 1676 in Boston. American coffeehouses served as one of the primary locations for revolutionary activities, including purportedly planning the Boston Tea Party. After the War of 1812, less expensive and high quality coffee began flowing in from South America. Beginning in the 1840s, tumultuous economic and social conditions in Germany led to decades of mass immigration to America, the newcomers (along with Scandinavians) bringing their foods, traditions, love of coffee, and some common Teutonic expressions, including kaffeekuchen (yeast coffeecakes), blitzkuchen (“lightening,” quicker cakes made without yeast), krummelkuchen (crumb cake), kaffeehaus (coffeehouse), kaffeeklatsch (coffee chat), and streusel (from streuen, “to scatter/strew”). Demographic changes generally take several decades or even generations to engender local culinary and cultural transformations. By the mid-19th century, coffee replaced tea and hard cider as the American drink of choice and German-style kuchen increasingly supplanted British baked goods as American coffeecakes. The British began referring to various baked goods served with popular hot beverages by the names “tea cakes” and “coffee cakes” akin to the initial “chocolate cakes,” which accompanied, but did not contain, chocolate. English tea and coffee cakes were typically unleavened cookies, scones, and crumpets (akin to what Americans call English muffins), or sweet yeast buns. In this vein, the “Tea Cakes” in The Cook and Housekeeper’s Complete and Universal Dictionary by Mary Eaton (England, 1822) were unleavened sugar cookies, while her “Coffee Cakes” consisted of small sweet yeast cookies. The latter usage eventually disappeared in England. On the other hand, the term “coffee cake,” denoting the beverage accompaniment, slowly spread to America, such as in The Family Physician by Samuel B. Emmons (Boston, 1844). It was not, however, until after the Civil War when the impact of German coffee traditions grew more pronounced that the term referring to the beverage accompaniment became commonplace in America. More typically, Americans initially used it to indicate a chemically-leavened butter cake incorporating brewed coffee into the batter, such as the “Coffee Cake” in the July 1860 issue of The Genesee Farmer (Rochester, NY) and the “Connecticut Coffee Cake” in Jennie June’s American Cookery Book by Jane Cunningham Croly (New York, 1870). As late as the 1918 edition of The Boston Cooking School Cook Book, Fannie Farmer employed “Coffee Cake” and “Rich Coffee Cake” in the “Cake” section to denote batters containing coffee, while her “German Coffee Bread” (a streusel-topped yeast cake) and “Coffee Cakes (Brioche)” in the “Bread and Bread Making” section entailed yeast-raised sweet breads popular with hot coffee. The “Coffee Cake” in The Godey’s Lady Book Receipts and Household Hints by Sarah Frost (Philadelphia, 1870), manifesting a lingering British influence, entailed simple sweet yeast cakes with raisins. A different Teutonic topping proved even more popular – streusel – a simple pastry of flour, sugar, butter, and sometimes spice. Since it has no liquid, streusel can contain a higher amount of sugar and butter than other pastries, which makes it tender and sweet. 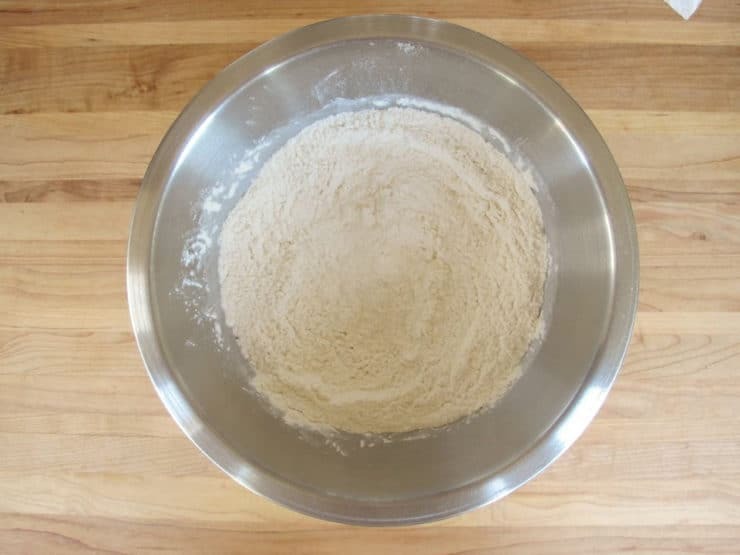 The larger the proportion of flour, the crumblier the texture, while a higher proportion of sugar results in crisper and more granular chunks. Streuselkuchen began appearing in Pennsylvanian manuscripts in the 1860s and soon in small German bakeries in the Northeast and Midwest. 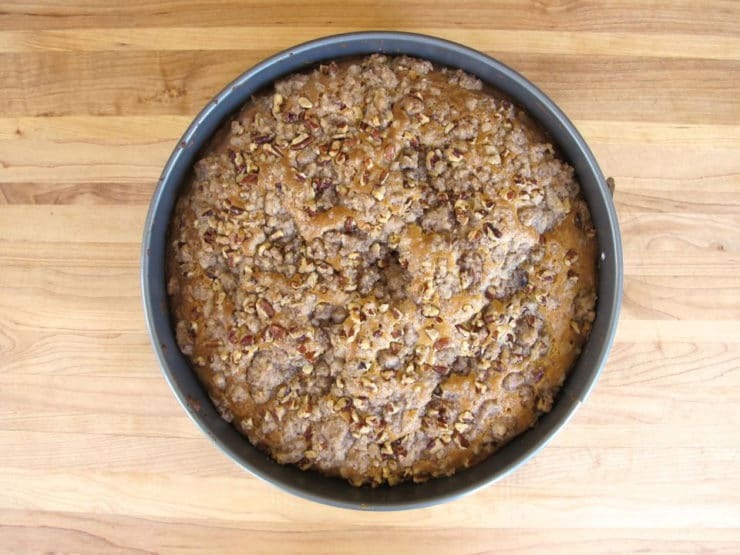 The “Streusel Coffee Cake” in A Book of Cooking and Pastry by C.F. Pfau (Quincy, IL, 1887), the first record of the word streusel in an American cookbook, was a traditional yeast-raised treat rolled out and topped with streusel. Meanwhile, the nature of American cakes and coffeecakes (the kind accompanying hot coffee) was changing corresponding to the popularization of commercial baking soda and baking powder. 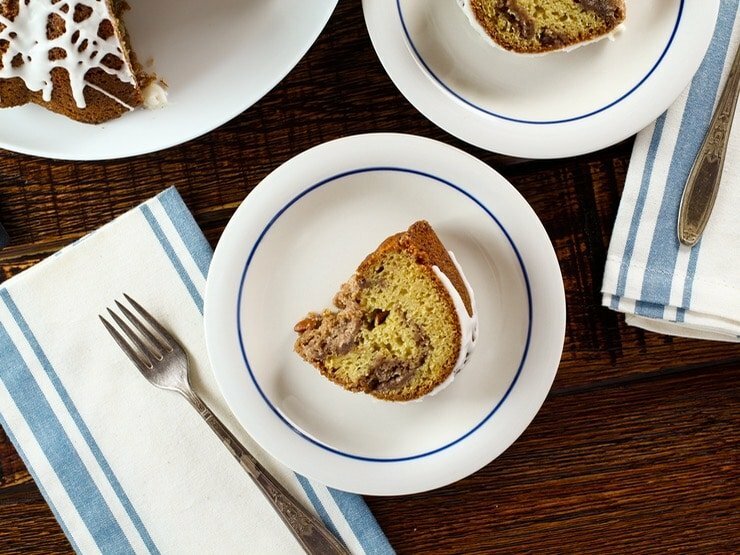 Chemically-leavened coffeecakes, a distinctively American innovation, are much easier and quicker to prepare. They fall in between quick breads and butter cakes. 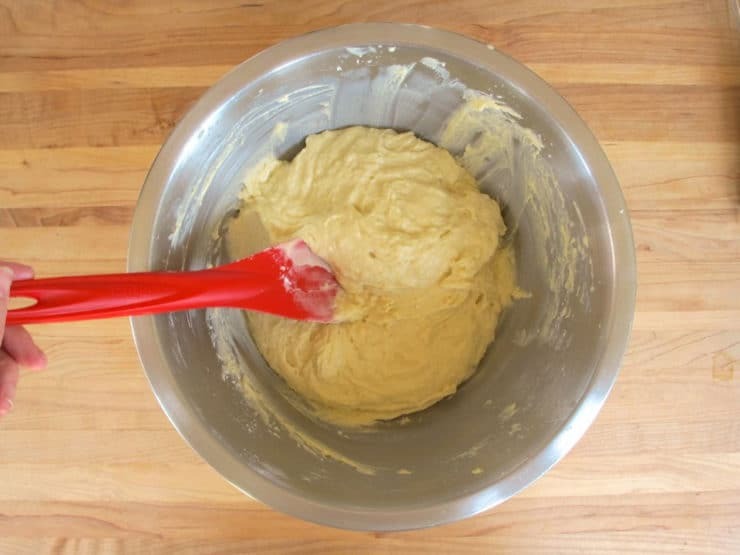 In general, coffeecake batter is more liquidy than quick breads as well as contains a bit more sugar and fat (either butter or oil), but less so than butter cakes. The final product is lighter, moister, and has a finer crumb than quick breads, but less sweet and intense than butter cakes. Coffeecakes are able to be prepared either like quick breads -— stirring together the liquid and dry ingredients -— or creamed like butter cakes. The creaming method produces a fine crumb. Whereas butter cakes are commonly frosted and quick breads tend to stand alone, coffeecakes are usually single-layered and lightly gilded with a glaze, streusel, or cinnamon-sugar topping or a combination of these -— almost never a frosting. Following World War I, pasteurization in America became widespread and practically eliminated various old-fashioned homemade naturally-fermented dairy products. 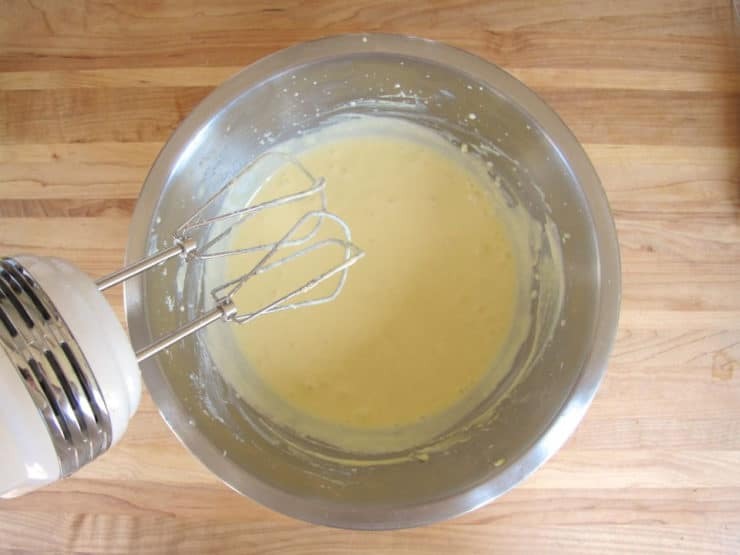 In cakes, instead of old-fashioned clabber and clabbered cream, Americans shifted to using commercial cultured sour cream (made by adding a bacterial culture to pasteurized light cream and heating at 71.6°F to achieve the desired level of lactic acid and medium sharp flavor). As with other commercial products, sour cream was initially sold in bulk and scooped out of barrels. Eventually, producers began packaging it in reusable 16-ounce glass jars. After supermarkets introduced refrigerated cases and innovation led to sour cream prepackaged in small plastic containers, this venerable Eastern European necessity became a standard of the mainstream American kitchen and ingredient in various baked goods. Sour cream coffeecake, sometimes called Russian coffeecake, emerged as one of the most delicious and popular of all coffeecakes. An early record of “Sour Cream Coffee Cake,” already topped with streusel, was in Streamlined Cooking: New and Delightful Recipes for Canned, Packaged and Frosted Foods by Irma Rombauer (Indianapolis, 1939), the author noted for being on top of and furthering contemporary food trends. This recipe subsequently appeared for the first time in her classic The Joy of Cooking in the 1941 edition. Soon some cooks moreover began to sprinkle part of the streusel in the center of the batter as well as on top, spreading the wealth and flavor. This dense coffeecake is not overly sweet or posh — proving ideal for breakfast, brunch, snacks, and other informal occasions — while the ample streusel makes it rich and impressive enough for a dinner dessert and any time of the day — even without coffee. The lactic acid in sour cream results in a tender crumb and also keeps the cake fresh longer. The fat contributes flavor and moistness. The slight tang of the sour cream and the warmth of the cinnamon-accented streusel perfectly underscore the velvety, buttery cake. 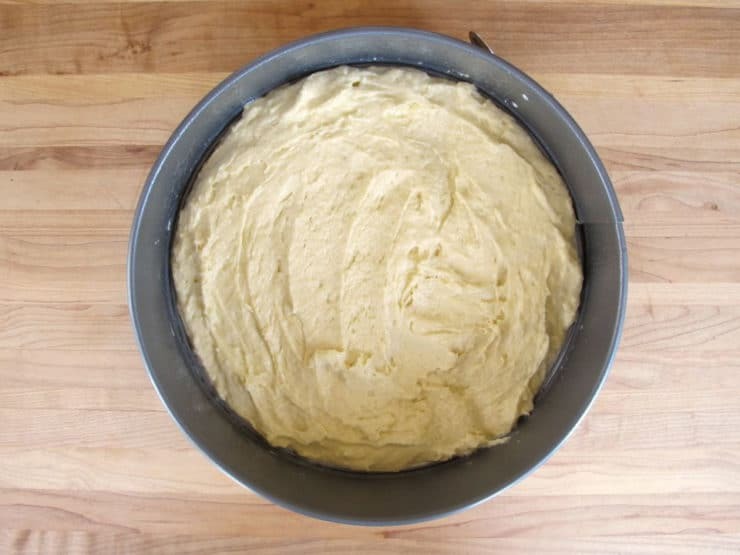 The batter is rather thick in order to support the heavy streusel. An optional topping of cream cheese or fruit filling or mixing in various additions enhances the sensory experience and provides variety. 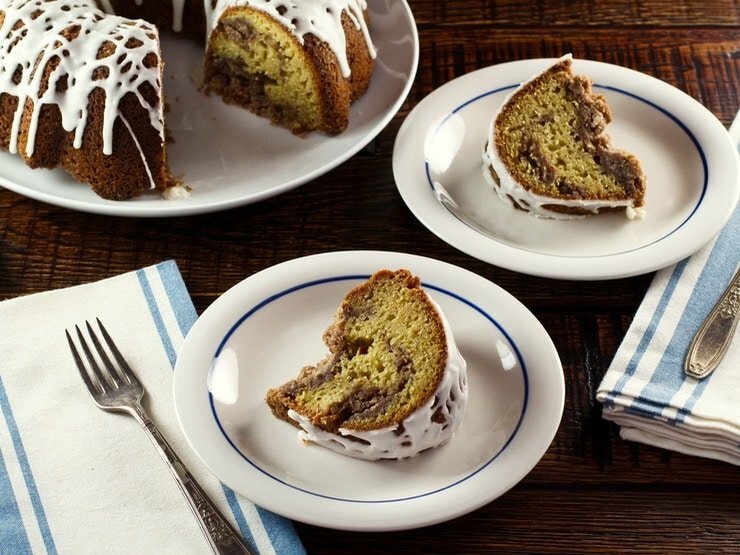 Coffeecake can be made in almost any type of pan, but many people prefer a Bundt. In some families, sour cream coffeecake became a Sunday brunch standard and even a Christmas, New Year’s, and Mother’s Day tradition. In 1959, the layered streusel version of sour cream coffeecake became de rigor in school cafeterias in Los Angeles. 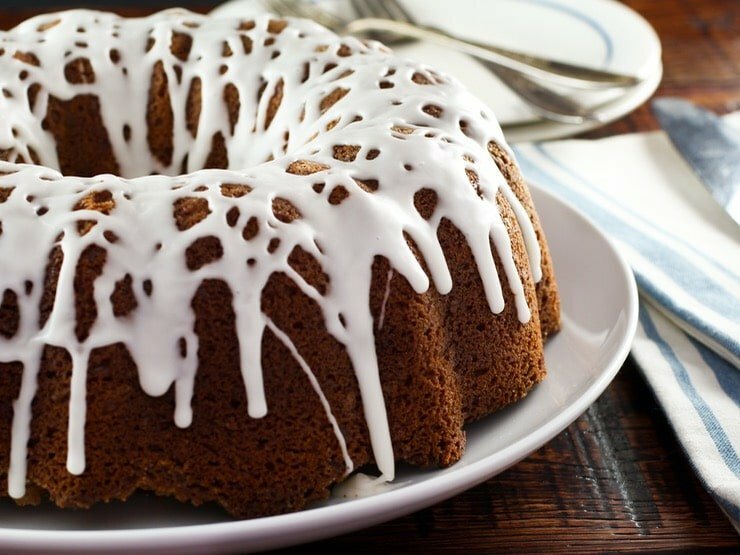 In the early 1970s, sour cream coffeecake made from packaged cake mix and baked in a Bundt pan was given a then contemporary name, Sock-It-to-Me Cake. 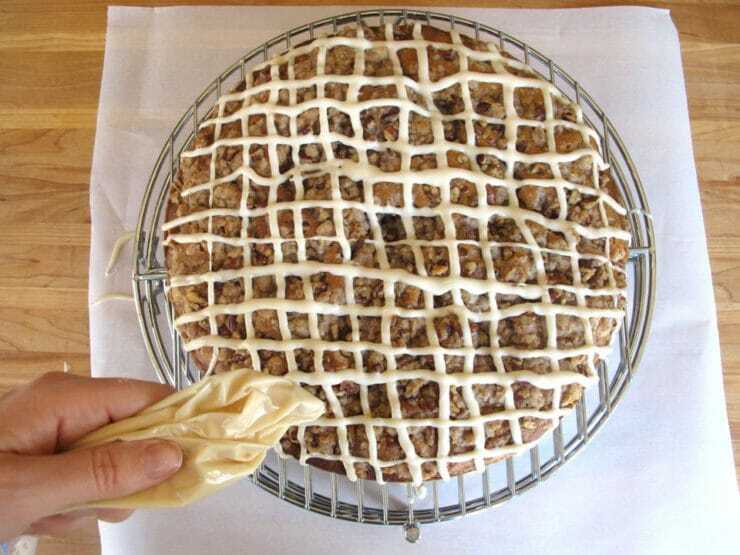 April 7 is National Coffeecake Day – as good occasion as any to enjoy this justifiably popular treat. Preheat the oven to 350°F (325°F for a convection oven or if using a glass pan). Grease one 9-inch (9 cups) Bundt or tube pan, 9-inch square pan, 10- by 8-inch baking pan, or 9-inch springform pan. 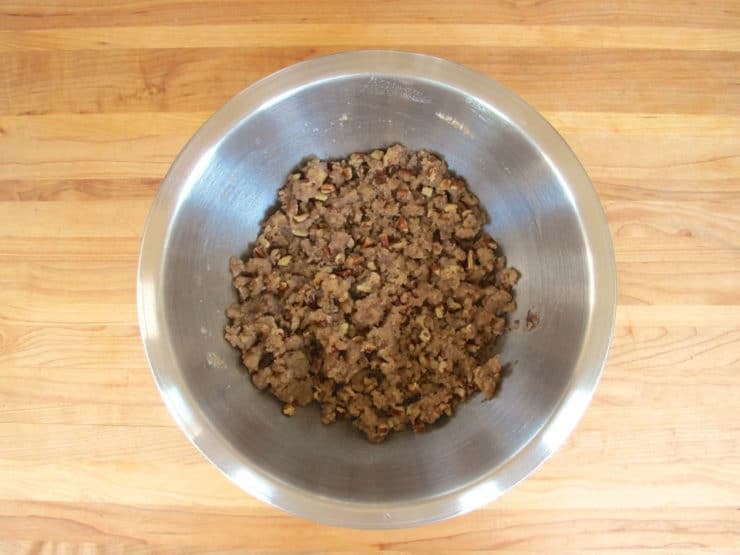 In a medium bowl, combine the sugar, flour, cinnamon, salt, and, if using, nutmeg. Stir in the butter to resemble coarse crumbs. If using, add the nuts. 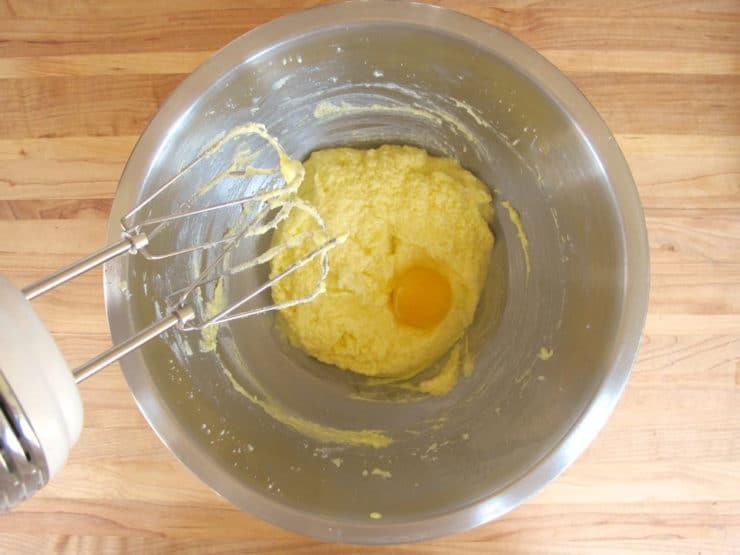 Combine the flour, baking powder, baking soda, and salt in a mixing bowl. 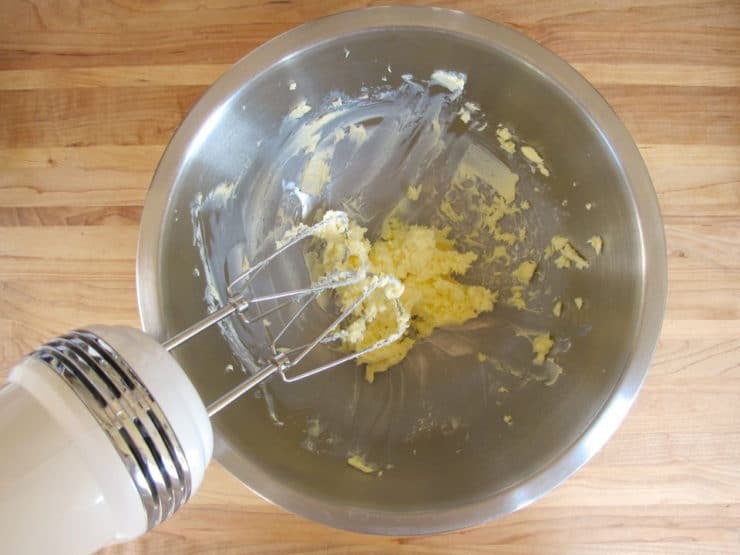 In a separate large bowl, beat the butter on low speed until smooth, about 2 minutes. Increase the speed to medium, gradually add the sugar, and beat until light and fluffy, about 4 minutes. 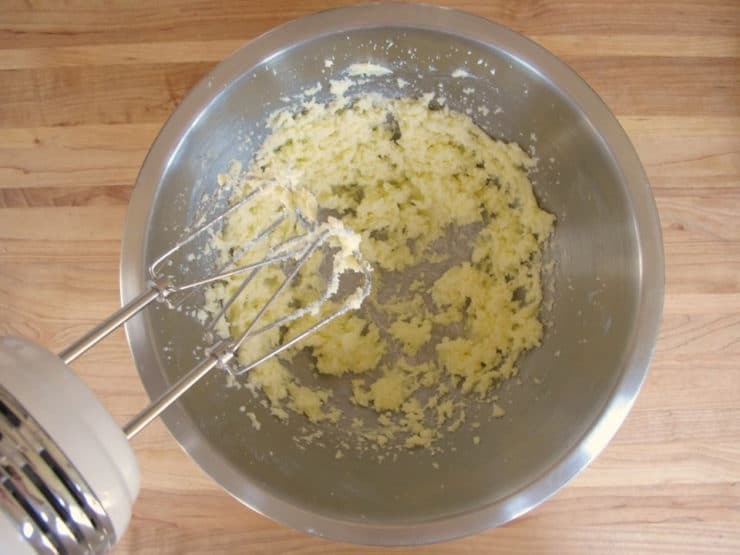 Blend in the sour cream, vanilla, and, if using, zest. Spread a little more than half of the batter in the prepared pan. Sprinkle with half of the streusel. 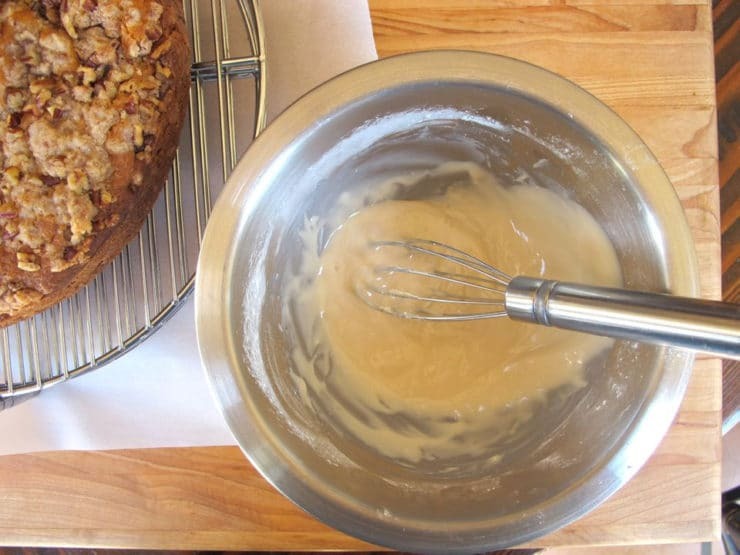 Carefully cover streusel with the remaining batter. 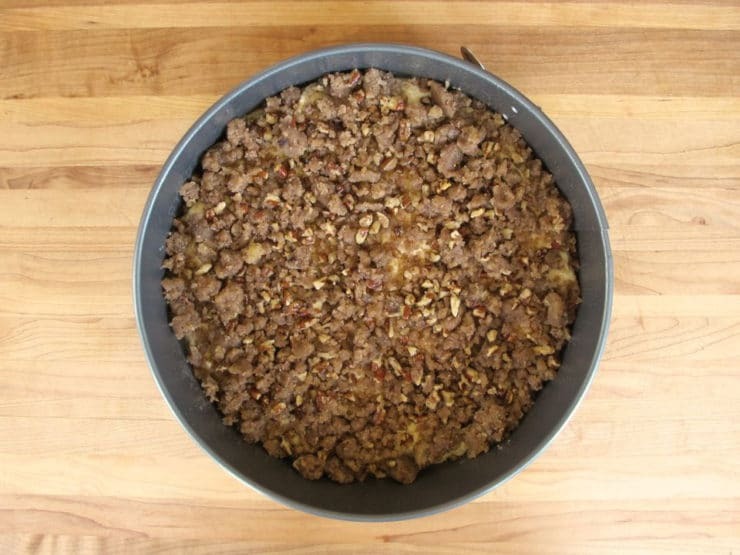 Top with the remaining streusel and bake until the cake is golden and a tester inserted in the center comes out clean, 50 to 60 minutes for a Bundt pan; 30 to 40 minutes for a 9-inch square pan; or 45 to 55 minutes for a springform pan; increase baking times slightly if using a fruit or cheese filling. Set on a wire rack and let cool in the pan for at least 20 minutes, then remove the cake to a wire rack and let cool completely. The cake tastes even better when allowed to mellow overnight. Wrap the cooled cake in plastic and store at room temperature for up to 4 days or in the freezer for up to 2 months. Combine all the glaze ingredients, gradually stirring in enough liquid until smooth and of pouring consistency. Drizzle over the cake and let stand until set. THK Note: we put the icing into a Ziploc bag, snipped off a corner with scissors, and drizzled a crosshatch pattern on the top of the cake. Sour Cream Cupcakes: Divide the batter and streusel between 12 (2½-inch) cupcake tins lined with paper liners and bake at 400°F for 18 to 22 minutes. Cheese-Topped Coffeecake: Combine 1 cup (8 ounces/225 grams) softened cream cheese, ¼ cup granulated sugar, 1 large egg, and 1 teaspoon vanilla extract. 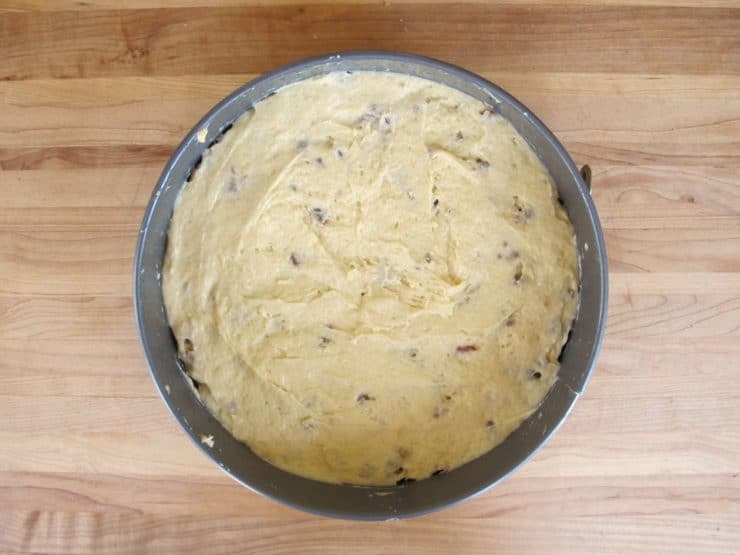 In step 4, after adding the remaining batter but before covering the top layer with streusel, drop spoonfuls of the cream cheese mixture over the batter, leaving a 1-inch border on all sides. Chocolate Swirl Coffeecake: In the streusel, substitute 3 tablespoons unsweetened cocoa powder for the flour and use the 1 cup nuts. 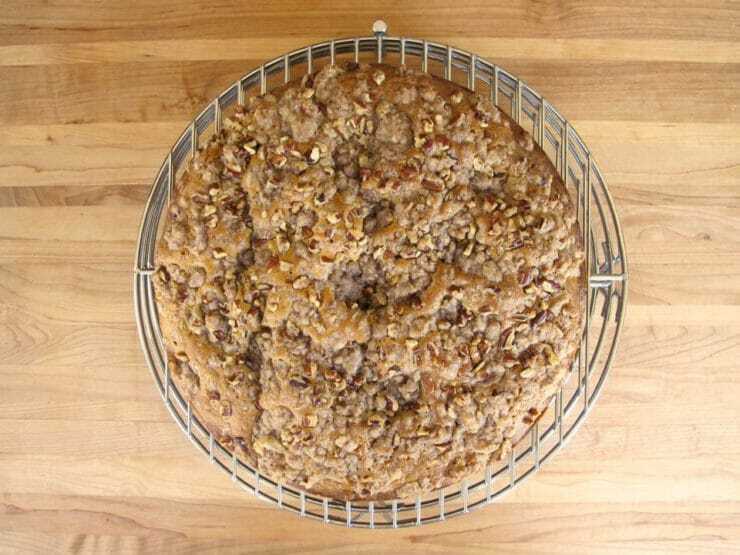 Fruit-Filled Coffeecake: After adding the middle layer of streusel, top with 1 to 1½ cups fruit or any combination, i.e. peeled, cored, and chopped cooking apples; peeled, pitted, and sliced peaches; pitted sour cherries (or canned cherry pie filling); or blackberries, blueberries, chopped cranberries, or raspberries. I need some help with a Passover recipe. I make ‘bagelich’ for Pesach and lately they come out nice and crisp on the outside, but somewhat gummy on the inside. They do not rise very much and I would be happy to send you my recipe, but need to know what is causing this. What a fascinating read! It’s always so interesting to see how the meaning of words evolves over time and across continents. Thank you for your clear instructions and beautiful photos. Very interesting history. My grandmother made a wonderful coffee cake, I never got her recipe. I do remember it had sour cream. I look forward to trying this one.